More Unlimited Constructed this week. Said global would both allow me to get Sidekick die out of my Field Zone (so I can field them again later) and provide fuel for Metallo’s ability. 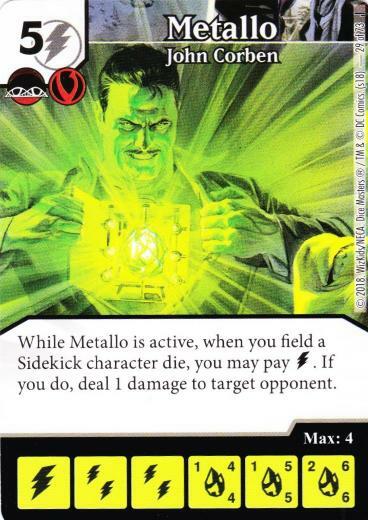 Also, this would potentially be one way of getting the energy I’d need to buy Metallo in the first place. Next addition was the Boom Boom that deals a burn damage the first time each turn I use a global. That gave me multiple 2-drops I was intending to buy, so I decided to include Big Entrance as my other BAC. With PXG and Instant War in the mix, my opponent has the potential to field a lot of Sidekicks in a hurry. 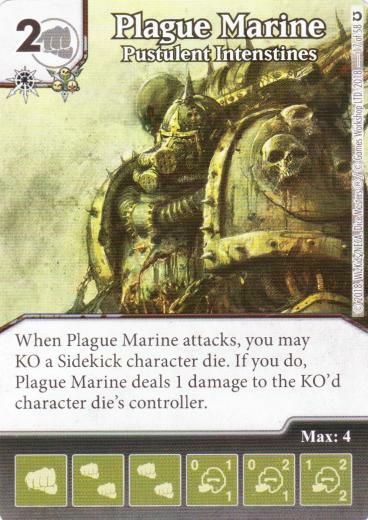 So I decided to add some things that mess with his Sidekicks: Plague Marine and Scarecrow. Attack with Plague Marine while Scarecrow is active, I get to KO an opposing Sidekick which means my opponent takes 1 damage and loses 1 life. My last piece was the new promo Black Widow. I hadn’t used her yet, and now seemed like as good a time as any. This was against our resident youngster. I did NOT use the team described above against her. She’s just not in the same ‘weight class’ as the other players in our scene, and instead of trying to drive one of my regular teams at 5 mph when playing her, I’d decided to put together a team of ‘fun’ cards to used against her. 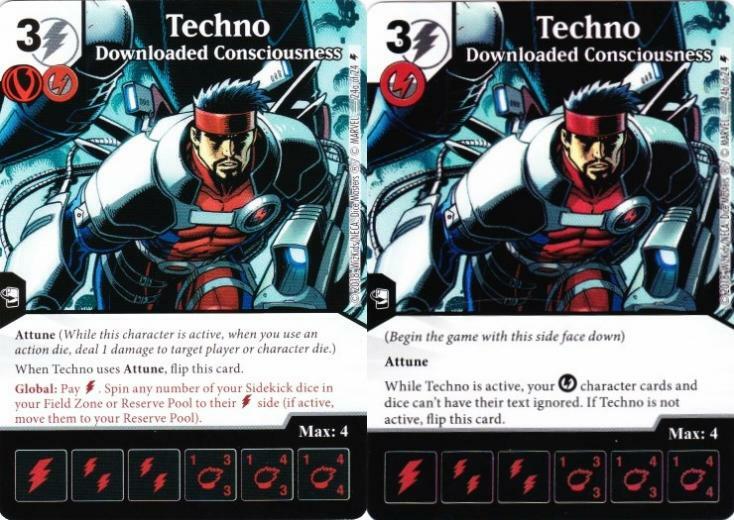 These were cards I’d been curious to see in action, but including on a serious team never seemed like a good idea. Cards like Common Hela, who has a when fielded ability that allows both players to Prep 3 non-Sidekick dice. And the Mysterio with the global that allows both players to Prep a die. 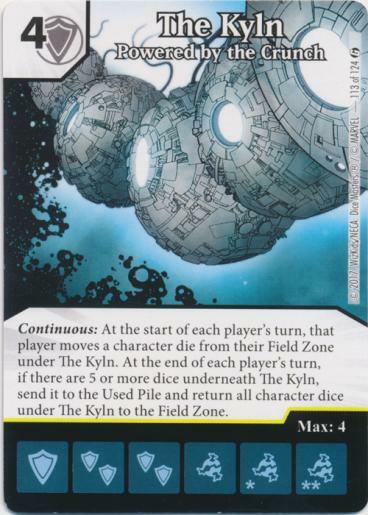 And Rare Kyln. I bought 3 Kylns, though only 2 were ever active. They kind of dominated the game however. I fielded the first quite early, when we both had little or nothing in our fields, and were devoting most of our attention to making purchases. Its presence discouraged both of us from fielding characters (the way our turns worked out, we usually only had the option to field one character each turn, which meant we’d just lose it to The Kyln at the start of our next turn.) She had a couple of her Sidekicks taken out of circulation for a good long while by the first Kyln, which probably helped her more than it hurt her. We did some damage sending attackers through each other’s empty fields. I also did some damage with Betrayal action dice, helped along by the fact every one I used was somehow on the double burst face, allowing me to Prep it after use. The key turn was where she was at 9 life, I think I was at 6. After my initial roll I had a Captain Marvel: Captain Carol Danvers and a Silver Sable: Wild Pack both on level 1, with a total 7 A. Her field is empty, but I’m two damage short. Captain Marvel’s A is 4-5-6, Silver Sable’s is 3-4-4. I decided to reroll both Captain Marvel and Silver Sable, the former comes up Level 3, but the latter comes up double mask energy. I can’t afford to leave my field empty, and my Level 3 Captain Marvel is swallowed by a Kyln on my next turn. Not long thereafter, she comes up with enough to finish me off. It was a fun, if unusual game. The only card I had on the team that cost less than 4 was the Stretch BAC (which is a 2-cost). I hadn’t actually intended to hamstring myself in that fashion, but I hadn’t checked to make sure I’d included a couple of affordable characters on the team either. This was an awkward team to play – moreso than I actually intended, as mentioned above. Still, I found it more enjoyable, when facing a clearly weaker opponent, to pilot an awkward team to the best of my ability and lose, than to pilot a strong team ‘badly’ and still win. Back to the regularly scheduled team. Up against an Iron Fist/Wong/Elektra/Parasite/Clay Golem combo platter. I got a bit of burn damage in before he got Iron Fist out (it was the promo who reduces ability damage in case there was any doubt). Iron Fist nullified most of my ability to do burn damage – I never seriously thought about buying Metallo in this game – but Plague Marines could still KO his Sidekicks which would allow Scarecrow to inflict life loss. HIs plan was to build up a wall, then when he had a Momentum die available, KO two of his characters to Fabricate a Clay Golem. Then KO two more to Fabricate a second Clay Golem, one of them being an Iron Fist, so the second part of Iron Fist’s ability would allow him to Prep the first Clay Golem. Then he’d use Momentum to roll the five character dice in his Prep Area. So he did that, and got mostly energy. Then he attacked with a lone Clay Golem, which I managed to KO, getting two of my non-Sidekick characters KO’d in the process. But he no longer had an Iron Fist in the field, and his wall had about four fewer characters in it compared to before he started the Fabrication. So between some burn damage (made possible by Iron Fist’s absence) and a mass attack where he couldn’t find enough blockers I managed to get to lethal. He probably would have had me if he’d been a little more patient. But he decided to swing for the fences, failed to make contact and paid the price. Jourdo and his Poison Ivy team. After a comical start, first neither of us could roll masks to use the Clayface global, then Jourdo getting frustrated because there never seemed to be any target for his Thrown Bricks other than Sidekicks, I got Jubilee out and did a little bit of burn damage before she was KO’d. I used the Techno global to find the energy I needed to buy Metallo, and quickly got him out on Level 3. I did a fair bit of burn damage with him – somehow, every time I wanted to field a Sidekick I had a bolt available to pay for his ability. I also got my Plague Marines into circulation fairly quickly. A couple of times they attacked, KO’d the lone Sidekick die in Jourdo’s field via their ability, and then went through unblocked. That’s only 3 damage total per occasion, but it did convince Jourdo to stop fielding Sidekicks. Which meant with my 6-6 Metallo attacking regularly, he didn’t have any Sidekicks to chump block with, making it awkward to keep his other pieces in the field. He did manage to buy an Ivy and start pounding away with her, but I’d gotten too much of a head start. I got Jubilee back in the field and between her and Metallo did enough burn damage from fielding Sidekicks to get to lethal. A pretty good team, although it really needs a removal or blanking option. Iron Fist slowed it down to a crawl. What would I remove for the blanker or removal option? Either Black Widow, or Boom Boom. I never bought the former, even though she might have been useful against Jourdo, and Boom Boom, while useful, was hardly essential. This Plague Marine and this Scarecrow synergize well together. My opponents ended up being reluctant to field any Sidekicks, so I didn’t do all that much damage this way, but it did denying my opponents a ready supply of chump blockers, which can turn out to be an advantage of its own. Also, using Instant War forced my opponents into fielding some Sidekicks for me to target, even if wasn’t exactly reliable. 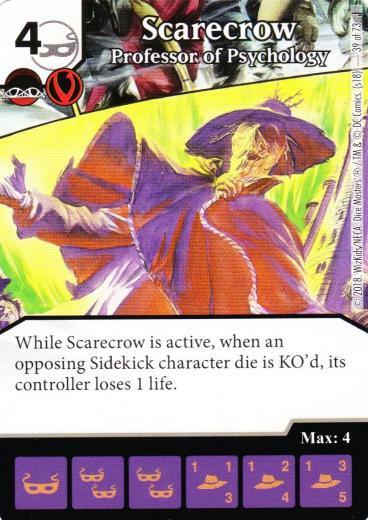 What are your favorite Sidekick focused cards? Let us know in the comments.